If you like mystery, noir, sci-fi, and conspiracy stories, you might like Android. I feel like I need to lead off pretty early on this one by stating that this game comes with a lot of pieces. A lot. There is no shortage of things you can do in this game, and there are pieces a-plenty to match up with your activities. Tokens representing Street/Corporate/Political/Social favors, alibi tokens, evidence tokens, trauma, baggage, dropship passes, witnesses, physical evidence, document evidence, and conspiracy puzzle pieces, suspect cards, event cards, and special event cards. And that’s just the shared pieces. There are 5 detectives included, each with unique parts and some unique rules, though each player has a character board with a light/dark tracker, a deck of light cards, a deck of dark cards, a flying car, NPC allies, NPC favors, Plot cards, and cards for that character’s special rules. Android! Note: not all pieces pictured. Ha. Yeah. That’s all in there. You certainly get a bang for your buck with this game, no argument there. And, in typical Fantasy-Flight front-running production value, the art is excellent, the parts of good construction, and everything looks very, very beautiful. If I could get a poster of the board’s artwork (minus all the locations) I’d hang it up on my wall. It is gorgeous. But gorgeous parts do not a great game make, so lets get on with it. Is Android a great game? I’m not going to go over the rules to specifically here. It usually takes about 45 minutes for me to explain how to play this game to someone, in person, because there is just a whole heck of a lot you can do, but I’ll give a brief overview. The game takes place over the course of 2 6-day weeks (I guess Crime takes a break on Sundays or something). Each day, every player gets about 6 hours to spend performing various actions – they can seek out evidence, uncover pieces of the conspiracy, play cards on themselves, and move around the board. As the game goes on, evidence piles up on the suspects, the conspiracy puzzle (a literal puzzle on the board) fills out, players collect favors (essentially, the game’s currency) and personal plots are unravelled as good and bad baggage piles up on each player’s plot cards. At the end of most days, an Event card is drawn which opens up an opportunity to find extra evidence or gain some other bonus (such as a sweet sports car that can travel a lot farther than normal cars), with an Event card directly related to the specific plot of the current game revealed at the end of the first week. Oh that’s right, did I mention the game starts with one of about 10 murder scenarios, which place the crime scene and the available witnesses on various locations of the board, and sometimes add extra game effects – such as costing extra time to move into certain locations. Each player plays as a character. This being a heavily dystopian/noir themed game, these characters are all dealing with personal issues that come into play via cards and personal plots. Floyd, for example, is an android. He must follow the 3 laws of robotics, which grant him bonuses – he gets 7 hours each day instead of 6, he can follow up a lead for free once per turn, he can’t gain any trauma – while, conversely playing restrictions on him – he has to return to his home base at the end of the 3rd day of each week or lose a turn, he is forced to choose certain outcomes during fights, etc. In addition, he has Tech cards he can play to gain further bonuses related to his enhanced Android abilities. Louis is a dirty cop who gains bonuses and penalties based on his mood, which changes based on the cards he plays. Rachel is a bounty hunter who can earn money, and then spend money to use certain cards that give her bonuses, but she is particularly vulnerable to attack from other players if her hand is too small. Caprice is a psychic clone who can play cards to utilize her psychic abilities, but is vulnerable to insanity. Raymond is a detective with a dark past, who has a lot of connections but has “memory” cards handed out to all the other players at the start of the game, which can be devastating if the other players get a chance to play on him. Lost yet? It keeps going. The goal of the game is not actually to find the murderer, although that is a small part of it. In fact, there is no predetermined murderer at the start of the game – the murderer is determined by totaling up evidence tokens, which have point values on them, that are stacked on each suspect’s card at the end of the game, and the highest total is guilty. Each player is dealt an “Innocent hunch” and a “guilty hunch” that are worth points at the end, and must set out to prove either or both, to earn points. Points are also gained by ending one’s personal plot with a positive ending (by loading it up with positive baggage). Favors, which are the games currency and can be spent to gain certain actions and bonuses, are not inherently worth points at the end of the game, but this is where the conspiracy puzzle comes in. 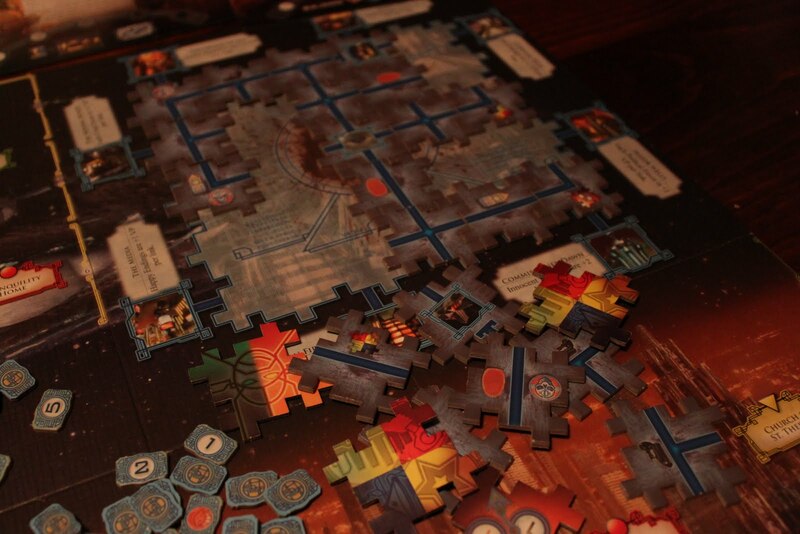 Players can place pieces of the puzzle, which are literal puzzle pieces, that connect to the center puzzle piece of the Conspiracy Puzzle. Each puzzle piece has a blue line on it, and around the edge of the puzzle are certain modifiers to points – +1 point per a particular favor, additional points for a happy ending, etc. – and each connection made from one of these to the center of the puzzle activates that modifier. Each modifier could potentially connect to the center 4 times, applying that bonus 4 times – so a single favor could be worth up to 4 points. Because of this, it’s important to pay attention to the puzzle and attempt to direct it towards favors you are collecting, and block off modifiers that would help the other players. I think Android is pretty fun. Lets go over the goodies first. Its pretty easy to say that there is LOTS to do in this game – you can travel around, uncovering the mystery, finding (planting?) evidence, uncovering the conspiracy – all sorts of things. During your own turn, you’ll never be bored. It’s exciting, working your way towards playing a key card from your hand (restrictions prevent more powerful cards from being played too easily), placing pieces of the puzzle, uncovering evidence. You’ve got to balance the evidence, with the conspiracy, with watching out for your personal plot / baggage, with building up resources – namely, favors – and flying around in your car. The art is fantastic as I’ve already said, and there are a myriad of references to science fiction. The conspiracy puzzle is a blast to uncover. Working your way towards makingyour ideal connections, blocking others off – there’s tension, there’s action, there’s competition – it’s pretty good. I say “competition” and even “Attacking” but in actuality, player characters don’t really interact with each other. You can’t fly over to another player and beat the crap out of them directly. Instead, you can pick up their “dark” cards during your turn, and play them against that particular player during their turn. These cards have restrictions, so people can’t just gang up on one player, or play a bunch of really powerful cards in a row. Still, it allows you to get in and interact with the other players, which is good, without totally killing it for another player, which is also good. Thematically strong, it can be enjoyable to read the flavor text on cards, which are written in dramatic, crime-noir fashion, telling a small part of a story but leaving most of the specifics to imagination. NPCs come into play unexpectedly, and sometimes what happens to them matters to the player. Personal plots add a personal element to the overarching plot, which is pretty enjoyable. Unfortunately, Android is not a game without flaws – flaws that many might consider “serious” or even deal-breakers. I can generally get past these and enjoy the game, but this game is definitely not for everyone. One thing to note is that while there are many powerful cards that can be played against the other players, these cards usually have trigger conditions. Conditions that can be avoided. For example, Raymond’s Memory cards can only be played if he has a full hand of 7 cards. The effects of these cards can be devastating, especially near the end of the game. But if you’ve played Raymond before, you know to avoid the 7-card hand. The other players are restricted to 6 cards anyways, so its not that big of a deal. Rachel can protect herself from most dark cards by keeping 3 cards in her hand. Its nice to have protection against the powerful cards, and it can be a sacrifice to drop a card (as Raymond) or to forgo playing a nice card (as Rachel) but the protection is usually worth it. The point is, if you’re playing with experienced players, those powerful cards pretty much don’t get a chance to get into play. If you’re playing with a newbie, they’re likely to get hit pretty bad at the wrong time. True, each player comes with a “strategy” card with some tips on how to stay protected – but this mechanic can result in discouragement of playing or taking cards, which takes a part out of the game. Some mechanics seem to be slightly broken in how they play out. The biggest thing I can think of here is Floyd, who is arguably the most powerful character in the game. True, he gets a lot of bonuses from his robotic “rules” cards, and his tech cards can give an enormous boost. However, one of his plots ends with a devastating restriction – Floyd must discard down to, and may only carry, 2 favors of any kind. In a game that often ends with 80-90 point totals, 40-50 of which are usually from Favors, this is essentially a game ender for that character. If this is the plot card you get in the second week of the game and it goes the wrong way for you, it pretty much means you’ve lost and there’s no hope of winning. There’s no hope of re-directing the conspiracy puzzle to block off all favors at that point. True, when playing Floyd you could always take the precaution of attempting to block of Favors from having point values right from the start, but in my experience Favors are a key part of winning the game, as it is nearly impossible to control the evidence very much in your favor. Its up in the air as to whether or not this actually breaks the game, but in my mind it skews it pretty heavily. It can clearly end the game for one player up to an hour before the game ends. And this is not really a game you want to keep playing if you know there’s no hope. 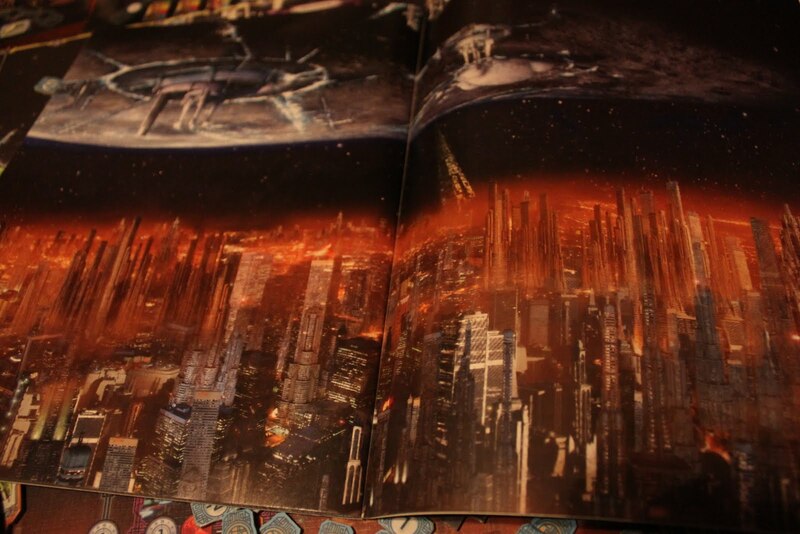 This is the art on the game board (sans locations). Pretty wicked. Which brings me to my last point: game length. Android takes 3-5 hours to play. You might be able to get it down to 2.5 with only 3 players, but you’d have to hustle pretty fast. 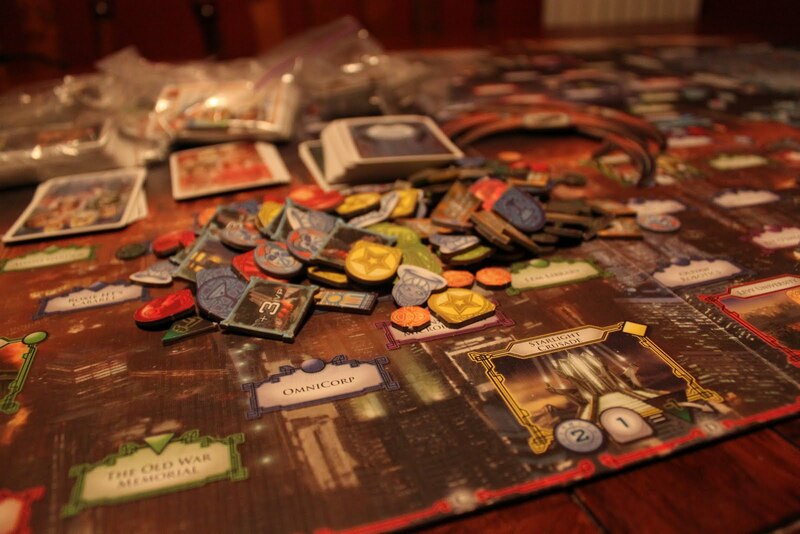 Now, I’m not averse to long games – I quite enjoy Arkham Horror which is another 3-5hr game. 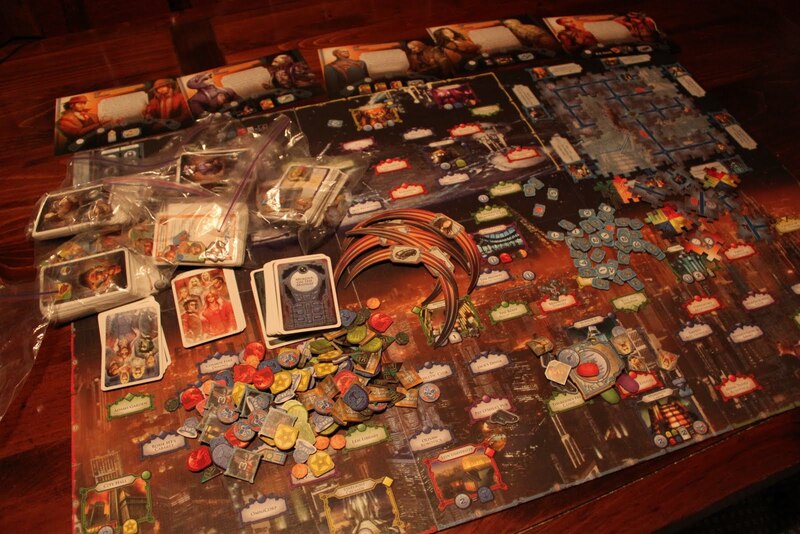 The problem here is, while Arkham Horror fills its length well, Android stretches on too long. In order to make it through Android, you have to mentally prepare yourself for a long, arduous journey. You need to be good friends with the people you’re going to play with – or at least prepared to become good friends. You need a lot of snacks. See, the real problem with Androids length is the length of each player’s turn. With the huge variety of things to do, a single players turn can take 5-6 minutes, with some turns occassionally going even longer. And this is without Analysis Paralysis. If you’re playing with 5 players, that means it can take up to 30 minutes between the end of one turn and the beginning of your next. That is a long time to wait. Yes, you can play “Dark Cards” on the other players during their turns, however the restrictions usually prevent you from playing more than 1 or 2 cards, and that’s not per player – that’s between your turn’s end and the next turn’s beginning. And if you even want to consider playing those cards, you have to make sure you pay attention to the conditions that allow you to play the cards, meaning you can’t just disengage for a bit while you wait your turn. Usually by the 2nd day of the 2nd week, the conspiracy puzzle is completely filled out. Actually, in my experience, the puzzle gets filled out before the 1st week runs its course – the rewards for placing a puzzle piece are just too tempting. When that puzzle is completed and out of play, it drastically simplifies what you can do – but doesn’t make turns shorter. Instead people start running around just collecting Favors that are worth points at the end. At this point in the game, things start to drag. People start to yawn and get tired, just holding out until the game ENDS finally. So, there you have it. Android is a complex game with many, many rules. So many rules its easy to forget the many ways to earn points or further your personal plot, even after the 10th time you’ve played. It’s varied and complex, with plenty to do, but the game can run a big long. 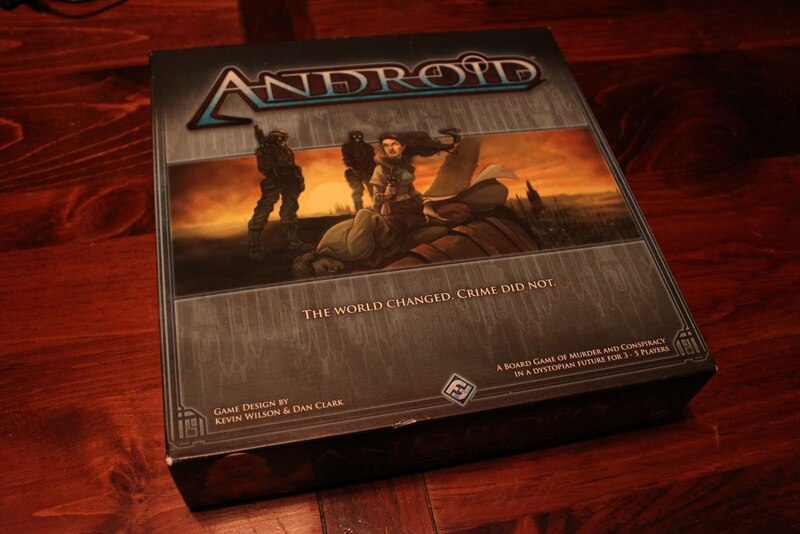 I find Android to be great fun when I set aside a night for it, have some friends over, and pile on the snacks. There’s plenty of room for conversation and munching, and spending time with buddies. This game is way to complex to be family-friendly. I wouldn’t recommend jumping into the game with a group of people you don’t know well – there is so much down time, you’ll want to be interacting with people just to pass the time at the end. There are a few issues with the game, but none that totally break the experience. Next time I play, though, I may attempt a variation which I think could speed things up and increase player interaction – instead of each player getting their 6 hours at once, then moving on, I think it might work better to go through each day 1 hour at a time, allowing each player their movement, then allowing a few seconds to play Dark cards in response to the other’s actions, then moving on to the next hour. I’ve never tried it that way, but I feel like it could help many areas of the game, especially the game length. Lots of things you can do. This is a nice review. Android is LONG. Thankfully, you told me that before going into it so I knew what to expect. And thankfully we were well stocked with snacks. I really enjoy this game, but it is Very, very, very long. The rules are incredibly complex and a newbie has little shot of winning, much less understanding the myriad possibilities available every turn. Game play however is a lot of fun, and it is fun to remember the stories associated with the various locations, as all the locations derive their names from Science Fiction. This is an interesting way to bide your time whilst you await your next turn. Although, I would like to point out that the first time Jon played he pulled out a victory. I chalk it up to good coaching. I would like to try that variation with Android next game. The waiting for each player to go through their six hour shift is hard. Still, Android is definitely fun. I’m not sure if having a predetermined murderer would ever add to the effect, but may be an interesting try.